The beaches, of course! And lots more. board and give it a try. One of the villas, Château Javalquinto, serves today as the Tourist Information Office, so you can admire a beautiful building and get maps and practical information at the same time. Another, Villa Belza, is a striking landmark overlooking the main surfing beach, Plage de la Côte des Basques. 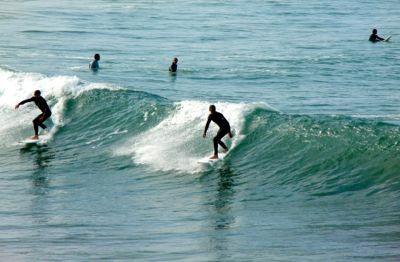 This beach is always full of surfers, trying to ride the waves. 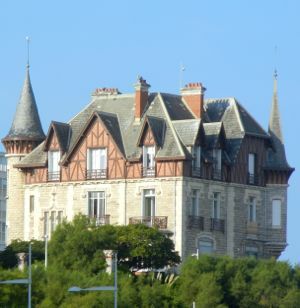 The Hôtel du Palais, overlooking the Grande Plage, was formerly the imperial residence of Napoléon III. It can only be admired from outside the fence, unless you're staying there. 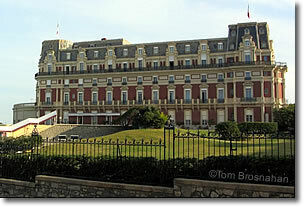 And of course there is the Casino Municipal, a lovely art deco building on the Grande Plage. In adition to various games and machines, it's also a meeting center. The fishing port, which serves both commercial and pleasure craft, also provides beautiful coastal views. The Port Vieux, or Old Port, is today a protected swimming beach. Several notable churches can also be seen in Biarritz. The Russian Orthodox Church, dating from the late 1800s, has a notable dome. The Église Ste-Eugénie overlooks the Place of the same name, a lovely old square above the port, with restaurants and cafés. Empress Eugénie (wife of Napoléon III) also had built the Chapelle Impériale, dedicated to Notre-Dame de Guadeloupe. 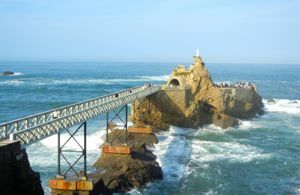 Biarritz is also home to several museums, including the Musée de la Mer, with its aquariums and marine research studies. It's just behind the Rocher de la Vierge. If you want to learn about the history of Biarritz, then head to the Musée Historique de Biarritz, telling the story of Biarritz's growth from a small fishing village to becoming the "Beach of Kings." And there's even a museum devoted to the history and art of chocolate making! The Planète Musée du Chocolat, just past the surfing beach, can show you all. 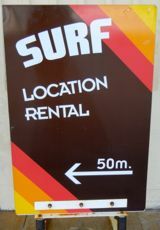 The Tourist Information Office has maps with suggested walking tours of Biarritz, one emphasizing the waterfront, the other the city's museums. Above, A beautiful villa in Biarritz. Below, The Rocher de la Vierge. Above, Hôtel du Palais, Biarritz.